I remember in high school asking my good friend (now turned author of dragon novels interestingly enough) for a recommendation for some new reading material. I was looking for something that was not what I had read. I needed a huge refresher from the Tolkien fantasy copycats. She suggested I read Anne McCaffrey's Acorna series. Not the first recommendation most would consider from McCaffrey, but I was thrilled with the complete change of pace. It, of course, then introduced me to the world of Pern. This is a unique style of biography scrapbook. It blends old photos with anecdotal stories. 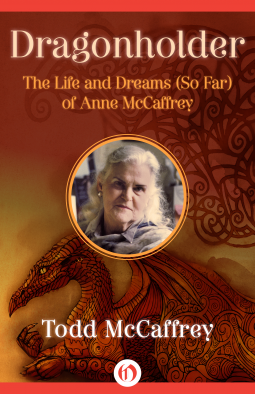 Written by her son and originally published in 1999, this biography shows not necessarily how dragons became to be Anne McCaffrey's bread and butter but how writing as a profession affects a person. Here came a lady in the late 60s who planned on writing in the man-club science fiction arena and being successful at it. Anne McCaffrey made the conscious decision to make her living writing about the creatures she so loved. In her mind they were not devilish monsters of irredeemable quality, they were noble creatures with as varying personalities as humans. She created a vast landscape where they interacted and grew. We loved and lost with ALL the residents of Pern as this book shows us the love and loss McCaffrey experienced while creating her vast universe of dragons. Todd shows great humor and love for his mother and her journey to make Sci-Fi a world for women authors. For the aspiring novelist, they should take a look at this book. There are plenty of examples why you don't become an international bestseller overnight and why authors typically have some other (very forgiving and understanding) day job. At only $7.99, it is a great introductory and fun lesson about writing.